The Language Service Registration Center (LSRC) is a service of the Arlington Public Schools' Department of Student Services and Special Education (DSSSE). 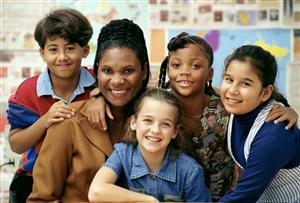 It facilitates the school registration process for families with English as a Second Language. It also provides language support to families, students, and schools through translation and interpretation services. Publish the “Survey of Limited English Proficiency Students”, annual report of the number of students and languages of English Language Learners in the Arlington Public Schools (APS). According to the APS “Survey of Limited English Proficient Students,” APS students speak 98 different languages; therefore, our Website is translated into the five most prevalent languages in APS: Amharic, Arabic, Bengali, Mongolian and Spanish. If you need translation or interpretation for languages not listed above, you may request our translation services; please refer to the Language Services section for instructions and tools. We will continue our efforts to bring more options for non-English speakers to access our website in the future.